Some years ago I bought this cheap USB gadget off Amazon. You connect it in-line with a USB-A device and it shows voltage and current on the power lines of a USB bus. There were quite a few slightly different models available under various brands. Apart from Muker mine doesn't have any specific model name visible (a similar product is currently listed as Muker V21 on Amazon). I chose this particular model because it looked like it had a nicer display than the competition. It also shows the time integral of the current to give an estimate of the charge transferred. Given that it cost less than 10 EUR when I bought it I didn't have high hopes as to its accuracy. I found it useful to quickly check for life signs in a USB power supply, and to check whether a smartphone switches to fast charge or not. However I wouldn't want to use it for any kind of measurement where accuracy is important. Or would I? I kept wondering how accurate it really is. For comparison I took a Voltcraft VC220 multimeter. True, this is not a particularly high-precision instrument either, but it does come with a list of measurement tolerances in its manual. At least I can check whether the Muker's readings fall with-in the error range of VC220. 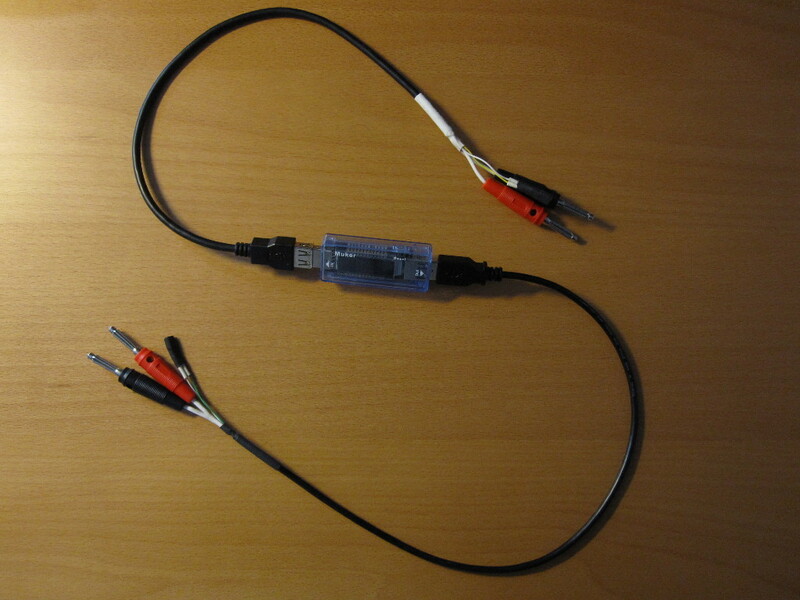 My first test measured open-circuit voltage. 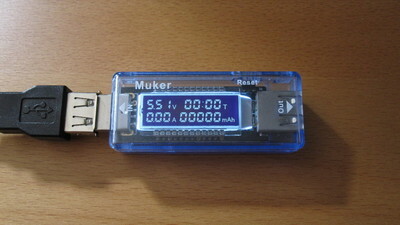 Muker's input port was connected to a lab power supply and the output port was left empty. I recorded the voltage displayed by the VC220 and Muker for a range of set values (VC220 was measuring voltage on the input port). Below approximately 3.3 V Muker's display went off, so that seems to be the lowest voltage that can be measured. On the graph below you can see a comparison. Error bars show the VC220's measurement tolerance for the 20 V DC range I used in the experiment. In the second test I connected an electronic DC load to Muker's output port and varied the load current. I recorded the current displayed by the VC220 (on the output port) and Muker. Again, error bars on the graph below show the maximum VC220 error as per its manual. Finally, I was interested in how much resistance Muker adds onto the supply line. I noticed that some devices will not fast charge when Muker is connected in-line, but will do so when connected directly to the charger. The USB data lines seems to pass directly through the device, so USB DCP detection shouldn't be the cause of that. In summary, the current displayed by the Muker device seems to be reasonably correct. 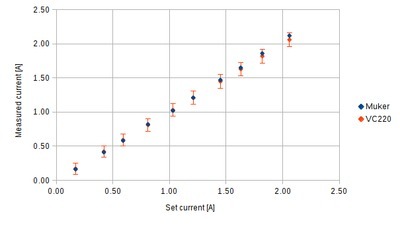 Measurements fell well with-in the tolerances of the VC220 multimeter, with the two instruments deviating for less than 20 mA in most of the range. Only at 1.8 A and above did the difference start to increase. Voltage readings seem much less accurate and Muker measurements appeared too high. 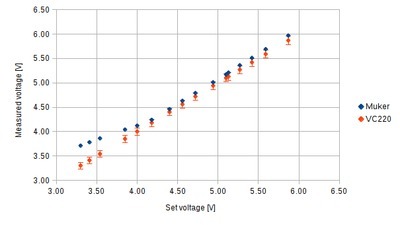 However they did fall with-in the measurement tolerances between 4.2 and 5.1 V.
In regard to increased resistance of the power supply, it seems that Muker adds about 270 mΩ to the supply line. I suspect a significant part of that is contact resistance of the one additional USB-A connector pair in the line. The values I measured did differ quite a lot if I wiggled the connectors.